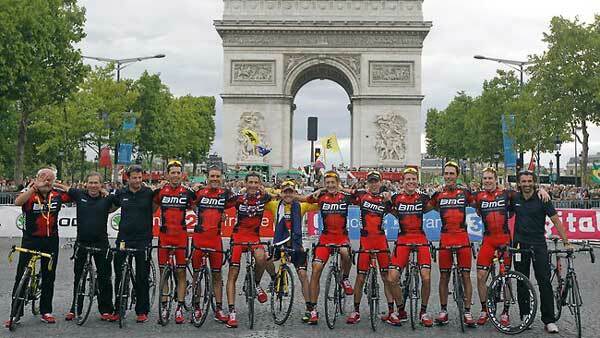 Like last year, Cadel is riding a BMC team machine SLR01 in the 2012 Tour de France. Same bike, hopefully same result. Last year, in the Tour de France, Cadel Evans rode a BMC teammachine SLR01 to climb, sprint and time trial his way to a victory in the yellow jersey. This year he rides… a BMC teammachine SLR01. The same name, but there are variations. Not a lot though, mainly around the seat stem. The video embedded below shows you the 2012 BMC SLR01. The team owners, BMC, are bicycle makers, so obviously the SLR01 remains its top machine. It will run the SRAM Red gear shifting system and the Shimano Ultegra group set. The frame is carbon fibre, and “consists of four monocoque components in which the carbon fibers run continuously from tube to tube”. In Australian dollars the bike is around the $8,000 mark, or $5,295 for the frame only. Click the thumbnails below to go to the BMC teammachine SLR01 image gallery, and view larger images of the bicycle. In the video below, Andrew James, the BMC Road Product Manager, provides an overview of the 2012 bike, and the changes from last year’s SLR01. Plus there’s a look at the very bike that Cadel Evans rode across the finish line in Paris last year. BMC teammachine SLR01 bicycle – Cadel’s victory machine?